Does Leeds need another cool, high quality, independent restaurant? 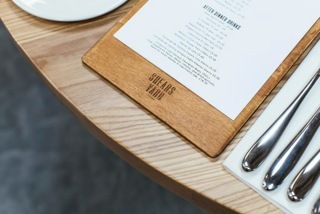 This week we were invited to the opening of another new restaurant in Leeds, Shears Yard. And it was one of those soft opening events for friends, family, food bloggers and anyone else who knows me type affairs. A very nice young lady from the PR team invited us along and in the interest of keeping our readers up to speed with the latest happenings on the Leeds food scene, we duly attended (it would be rude not to). 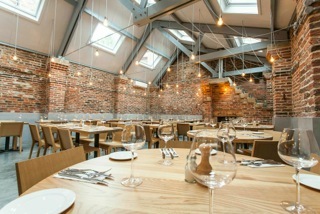 The location of Shears Yard will be very familiar to Leeds diners: it’s the old Livebait building down on The Calls. For years, Livebait plowed a lonely, fishy furrow in the city for many years and was for a long time one of our favourite places to eat in the city. But the world changed and eventually it closed and whilst it’s a shame to lose a restaurant it’s tremendous to see new blood too. Whilst Shears Yard is a new kid on the block, it also has some serious Leeds foodie provenance with the owners of the venerable Art’s Cafe striking out in a bold and entrepreneurial fashion. It’s also worth noting Art’s has been a long-standing success with loyal customers in the ultra competitive world of eating out in Leeds, so these guys know what they are doing. The first thing to say about Shears Yard is they have loving and stylishly re-designed the restaurant making the nineteenth century rope and canvas warehouse look effortlessly cool and very 2013 Scandinavian chic. If first impressions are everything, then we’re off to a good start. The branding is clean and pared back minimalism, conveying confidence and individuality – this is no chain. The menu is refreshingly simple too, using in season ingredients and fashionably bizarre combinations to intrigue and delight. Although this was an invite only event, we could order from the main menu, so the kitchen were up and running. The mood was relaxed and efficient – although the restaurant was busy, service was brisk and cheerful with hardly any opening night glitches. To start J selected the intriguing chilled pea custard with goats curd and I dived in for the scallops ‘old fashioned’ with Bowmore whiskey and orange glaze. Mains were fillet of beef with oxtail and marrow croquettes with Mrs D choosing the roast turbot with chicken fricassee. These were all excellent, with presentation of the food of a particularly high standard. Puddings had to be done and both the passion fruit creme brulee and the poppy-seed and raspberry muffin brought smiles to our faces. I expect the restaurant will settle in very quickly, find its place in the dining out pecking order and if the standard on the opening night is anything to go by, then Leeds has another bright prospect. Does Leeds need another cool, high quality, independent food establishment? Well, we don’t have anywhere near enough, so I’d say hell yes, welcome to Shears yard and I will return as soon as I can.